Meaning and Definition of Proprietary Colonies: Proprietary colonies were territories granted by the English Crown to one or more proprietors who had full governing rights. A proprietor was a person granted governmental powers over a tract of land. Proprietary Colonies were run under a colonial charter agreement, which was reviewed by the ruling Monarch. There were three types of colonies and systems of government in the British Colonies of North America - Proprietary Colonies, Charter Colonies and Royal Colonies. The Royal Colonies were ruled directly by the English monarchy and the Charter Colonies was generally self-governed, and their charters were granted to the colonists as opposed to proprietors. Prior to the establishment of Royal, Charter and Proprietary colonies the British colonization of North America had been financed and settled under the jurisdiction of joint stock companies operating under charters granted by the crown. 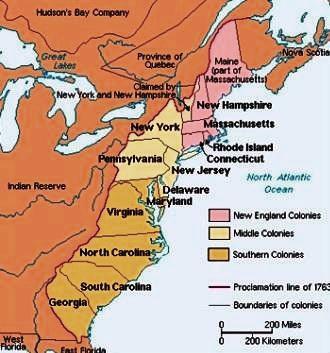 Proprietary Colonies were types of settlements in British Colonial America that were established between 1660 and 1690. King Charles II established the first Proprietary Colonies in order to repay debts and favors. The British crown awarded their most loyal supporters with vast tracts of land in colonial New York, New Jersey, Delaware, Pennsylvania, Maryland, and the Carolinas. The proprietors were given the authority to supervise and develop the colonies into successful and profitable enterprises. The lands were quickly colonized with British subjects at the expense of the proprietors. The three types of colonies and systems of government in the British Colonies of North America consisting of Proprietary Charter and Royal Colonies could change in status according to the political and economic changes in Great Britain. The government of a self-governing Charter colony or privately owned Proprietary Colony could therefore change to a Royal Colony when the power reverted to the King. The colonies of New York, New Jersey, North Carolina, and South Carolina also began as proprietary colonies, but later became royal colonies. Just before the Revolutionary War, there were three propriety colonies: Delaware, Maryland, and Pennsylvania. George Calvert, Baron Baltimore, was at first interested in the colonisation of the New World for commercial reasons but later aspired to create a refuge in North America for English Catholics. King Charles I agreed to his petition for a colonial grant for a Proprietary Colony but Calvert died before the charter for Maryland was officially granted. On June 20, 1632 his son, Cecil Calvert, became the Proprietor of Maryland. Dissatisfied Protestants overthrew the Catholic dominated proprietary government and in August 1691 the new Protestant British monarchs William III and Mary II, appointed a royal governor. In May 1715, Maryland was returned to the fourth Lord Baltimore who was a Protestant and the original 1632 proprietary charter was reinstated. 1681 King Charles II awarded William Penn the areas encompassing Pennsylvania and Delaware as a refuge for British Quakers in repayment of a debt. His proprietary authority was revoked in March 1692 but returned in August 1694. Delaware was part of Pennsylvania until 1703 when it created its own legislature. 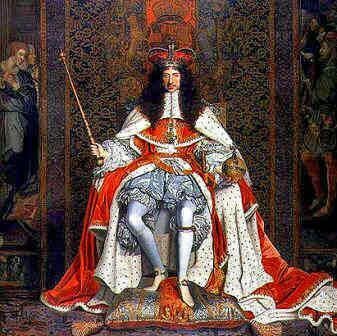 In 1663 King Charles II granted the Province of Carolina to seven aristocrats, the governor of Virginia and their heirs. There were therefore eight Lords Proprietor of the Province of Carolina. The names of the Lords Proprietors of Carolina were the Earl of Clarendon, the Duke of Albemarle, Lord William Craven, Lord John Berkeley, Lord Anthony Ashley, Sir John Carteret who later became the Earl of Granville, William Berkeley and Sir John Colleton. The Lords Proprietors of Carolina realized that it was not possible for one governor and one assembly to manage a colony as big as Carolina. The major settlements in the Carolinas of Cape Fear, Charles Town and Albemarle were miles apart and travelling between the settlements was time consuming and difficult. In 1691, the Colonial Proprietors of Carolina appointed a governor for the whole of Carolina and a deputy governor for the North of the colony. In 1712, North and South Carolina were officially divided. In 1719, South Carolina, which had more resources than North Carolina and more valuable to England, was taken back from the Lords Proprietors and made a royal colony. By 1729 all but the heir of Sir George Carteret, had sold their shares in the colony to the Crown and North Carolina also became a royal colony in 1729. In March 1664, King Charles II granted his brother, the Duke of York, a proprietorship between the Delaware and Connecticut Rivers, which included New Netherland which became New York. New York became a Royal Colony in 1685. In July 1664, the Duke of York granted the Jerseys to John, Lord Berkeley, and Sir George Carteret. In 1674 Lord Berkeley sold his half share of West Jersey to the Quaker partnership of John Fenwick and Edward Byllynge. In 1681 the heirs of Sir George Carteret sold the East Jersey lands to twelve proprietors including William Penn. New Jersey became a royal colony in 1702. By 1690 there was considerable British concern about the growing independence of the colonists in the Proprietary colonies and complaints about mismanagement. These concerns led to the end of proprietary grants and an attempt to change all Proprietary Colonies into Royal Colonies. Just before the Revolutionary War, there were three propriety colonies: Delaware, Maryland, and Pennsylvania. After the American Revolutionary War these three former proprietary colonies paid the heirs to the Calvert (Maryland), Penn (Pennsylvania), and Grandville (Carolina) minimal amounts for confiscated lands. The last Proprietary Colonies of Colonial America were Massachusetts Bay Colony (which included Maine), Connecticut and Rhode Island. We hope that this article on the first Thirteen will assist in your studies or homework and that you will enjoy watching the videos featuring many pictures of the colonists. A great educational resource for kids on the subject of the Proprietary Colonies.